When it comes to a brand, standing out is the primary goal. A company brand is past, present and future. It is what they are now, what they want to be in the future, and what they are representing to potential and devoted clients currently. Properly branding a company helps them to not only stand out from competitors but also helps them realize their potential. It also lets the consumer know what to expect from that company. Branding can be a promise of quality, trust or service. Brand Identity: Recognition and knowledge of a logo or business based on the customer’s experience. Brand Meaning: Defining the company beyond just an image to include product or business features, reliability, value and expertise. Consumer Relationship: Helping to shape the ultimate attitude of a customer toward a company. By defining what your brand is up front, you help establish your company as an industry leader and key influencer. And making sure that your logo balances your brand at the top can be quite the process. Many businesses use networking as a key factor in their marketing plan. It helps to develop a strong feeling of trust between those involved and plays a big part in raising the profile and brand of a company. From Nike to you, using your brand is what makes you stand out. And, in the name tag world, a personal brand comes when you wear a name tag with your name to identify yourself as an individual and to stand out in a crowd. By wearing personal identification products, one makes themselves more visible to others and opens the door to better experiences at large events. Most often you can see this type of brand at large corporate meetings or conventions where the individual needs to stand out from others. Branding only works when you use your name tags and other personal identification correctly with logos, titles and names. Make sure that your logo is the same for everything you use. A common mistake is not sticking to a particular color. If you’re using blue, make sure it stays the same shade on all of your products. While this may seem like a no-brainer, blues often print out with a purple look to them. Not only do these colors pertain to your company’s printed materials but it is something actively considered in personal identification. 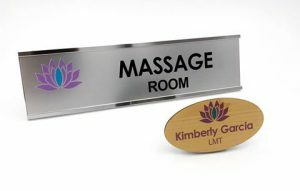 Utilize name tags, name plates and other products by using the same colors, logos and styles on everything. Your name tag reflects who you are and humanizes you to others. Most people tend to judge on first impressions, especially when everyone in the room is a stranger. But, if you have a way to make yourself stand out, your brand will become recognizable. And, it helps to make others more at ease around you.